Hibernian's Ian Murray faces a battle to prove his fitness ahead of Saturday's Edinburgh derby. The 27-year-old, who can play in defence or midfield, has been sidelined for two months with a groin injury. "Ian has been training both on his own and with the rest of the squad," boss Mixu Paatelainen told the club website. "He has been working exceptionally hard but we will need to wait and see how he progresses ahead of the game. He'll be given every chance." Paatelainen added: "It would be great to have him in the side at the weekend. "He is one of our players who has been through these games many, many times and knows how to handle them as well as anyone at the club." 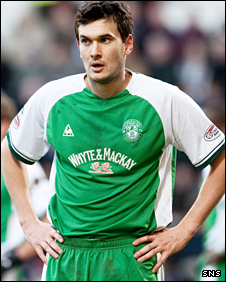 Murray began his Hibs career in 1999 and went on to take the club captaincy before joining Rangers in 2005. He returned to Easter Road two years later following a spell with Norwich.